Japan earthquake map built through Development Seed's MapBox; see it live. Every time something happens in the world these days, somebody makes a map about it. We saw it with last January's devastating earthquake in Haiti, the rollout of the U.S.'s long-awaited National Broadband Map in February, the personalized maps that accompanied April's iPhone tracking story. We see it every election. And with the increasing availability of free and open-source (or simply) cheap mapping tools, and the growing footprint of the open data movement, democratized mapping is likely only getting started. Mapping isn't perfect, to be sure. The U.S. National Broadband Map is, at the moment, the subject of a debate over the accuracy of the data it reflects. And mapped geographic data can be politically sensitive; writer Evgeny Morozov has drawn attention to the case of Japan's Burakumin, an outcast class whose mapping started as a sign of increased cultural awareness but raised talk of pogroms. But the growth of the digital mapping space makes it worth considering things from the perspective of the people who devote their time to making these maps. Why do they bother building maps? What are they hoping to do? What aspects of mapping do they worry about? In short, what do they think about when they're mapping? Gregory Asmolov is the co-creator of Help Map, a collaborative mapping project that connected victims of last summer's Russian wildfires with those willing to help. Brian Boyer is the news applications editor at the Chicago Tribune. Steve Coast started OpenStreetMap, a visual Wikipedia of sorts of the world's geography. Eric Gundersen is co-founder and president of Development Seed, a Washington DC firm that powers maps for use in international development work and other fields. Jason Hoekstra is a technology solutions advisor at the U.S. Department of Education. Patrick Meier is the director of crisis mapping and partnerships at Ushahidi, a global non-profit mapping company that grew out of the 2007 post-election violence in Kenya. Andrew Turner is the chief technology officer at GeoIQ, a mapping company that sponsors GeoCommons, an online hub for geographic data and maps. Jeff Warren is the director of research at the Public Laboratory for Open Technology and Science, or PLOTS, which uses low-cost tools to empower communities to map their own spots on the planet. First, let's start at the beginning. Why do we map? Basic cartography is nothing at all new, said several mappers. Humans have a mapping reflex, says Ushahidi's Patrick Meier. Mapping goes back to our nomadic days, says GeoIQ's Andrew Turner, where temporary annotations scratched on the ground or on rocks helped keep track of where the water was, or where unfriendly folks lurked. "We have a culture and mindset geared towards mapping." What's changed in just the last decade is that more humans have more access to more tools and information that make advanced mapping possible, even easy. Arguably, it really began in 2005, when independent developer Paul Rademacher built HousingMaps.org, a mashup of craigslist apartment information and Google Maps, to making his housing search easier. Google employee's blogged that Rademacher's work "blew our minds right off our shoulders," he he was soon hired by the company. "The 'where' of maps provide actionable element to information," explains Meier. "And as we're moving from dead maps to live maps, we're representing reality in a more faithful way. Things are changing around us all the time. And we're shifting towards participatory mapping, so that people are able to work together to create those live maps." For Ushahidi, that means that nearly anyone can submit a violence report or request for help through a range of technologies, whether it's a text message, web form, or Facebook. The Ushahidi platform has been implemented in post-earthquake Japan and by the U.N. Office for the Coordination of Humanitarian Affairs during Libya's ongoing civil upheaval. Or, as Development Seed's Eric Gundersen puts it, "mapping has always been expensive, and the dudes that had the maps [are the ones who] had the money." Now, almost anyone can make a map. In some cases, the availability of cheaper, more nimble mapping tools is equipping governments to make greater use out of the data that it collects and shares. Jason Hoekstra helped pull together the Department of Education's new map showing how schools across the United States of America are connected to the Internet. That map came out in March, and is based on Development Seed's open-source MapBox suite. "The map space will be positively disrupted" by these more accessible tools, says Hoekstra. "Before, this all wasn't as possible." In other cases, low-cost tech and online collaboration means that normal men and women on the streets can challenge the dominance over geography what was once the province of governments and other big entities. "OpenStreetMap started simply," explains Steve Coast, going back to its start in 2004. Google Maps had yet to launch. "And I just wanted a map of my local area, but in England, the maps are owned by the government." The Ordnance Survey controls how data collected by authorities can be used in the UK. So he set out in his Regent's Park neighborhood armed with a GPS and a Linux-based laptop, transcribing as he went the streets he was tracing with his movements. He put what he'd made up online, and invited people to expand it beyond Regent's Park, beyond London, beyond the United Kingdom. They did. OpenStreetMap, still openly editable by any user and free to use under a Creative Commons license, is now the basis for civic maps used all over the world. Video showing edits made to Port-au-Prince's OpenStreetMaps presence in the wake of Haiti's earthquake. But why bother? "Whenever you need a common operating picture," says Gundersen, "you need a map." When it comes to the development and crisis situations where Development Seed has made its mark, those maps have often come in the form of giant paper ones tacked up on the wall of some field headquarters somewhere. Gundersen hopes for the day when, instead, aid workers or election monitors in, say, Sudan, can be equipped with an iPad or other tablet that contains data-rich, zoomable "slippy maps" that work no matter whether there's an Internet connection to the device. Last-mile cartography, he calls it. For Gundersen, mobility offers the promise of giving workers in the field the same actionable data that once was only available to someone sitting behind a computer, running often expensive and bulky software. Department of Education's Schools & Broadband Availability Map. There's also the faith that geographic data, well mapped, can reveal truths and stories that rows and columns in a spreadsheet can't. A map created by Development Seed for the New America Foundation shows drone strikes in Pakistan's tribal regions that are color-coded according to whether they were ordered by President Bush or President Obama, and mapped against survey data on local support for military action in the region. For Hoekstra, mapping school broadband access in America puts gaps in plain sight. "You get sixty miles outside Atlanta," he says, "and there's just no broadband. But you wouldn't be able to see that without these visualizations." In 2009, water line data was used to point out that black residents of the Cole Run neighborhood of Zanesville, Ohio, were likely to not have access to running water. A project of Columbia's Spatial Information Design Lab mapped Million Dollar Blocks, as in city blocks where that amount or more is being spent by government to incarcerate residents each year. But all to what end, really? Depends on the map. The school broadband map "is meant to inspire a conversation," says Hoekstra. The Obama White House recently posted an interactive map of potentially excess federal properties, hoping to focus a conversation around creating a political mechanism for selling off those properties similar to the process used to close military bases. 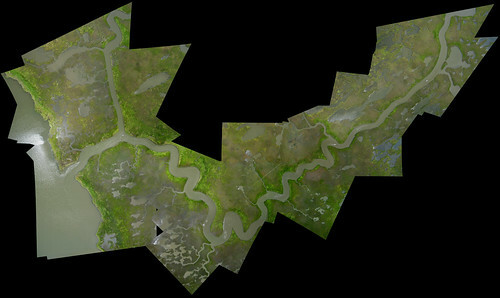 Gulf Coast imagery produced through the Grassroots Mapping project. For the Chicago Tribune's Boyer, often the intention, or at least one of them, is to help his reporters find stories, whether that's a map that readers are asked to populate, like last year's map, or city data plotted internally to see if there might be a tale lurking within. Gundersen points to the fact that some of the information mappers are able to glean from a map might be data that users don't even realize they're providing; newer tools let map creators track where people are clicking and zooming. And in some cases, the goal is maps that don't look like maps at all. Jeff Warren and his allies have run a project they call "Grassroots Mapping" that sets up communities to take aerial photographs of their environments by using cheap tools like balloons and inexpensive cameras. A mapping project of the Gulf Coast tracked the real-time spread of the BP oil spill using kits that cost less than a hundred dollars. (Related: Warren spoke at PdF '10 on mapping the Gulf. ) Similar maps of Appalachian slurry ponds and mountaintop removal mining convey information once limited to governments and corporations. Warren uses various tricks to tie the aerial photographs that come back to earth from their balloons to your more usual geographic maps, matching a giant red "X" painted on the ground. The combined effect can be powerful: recall If It Were My Home, a site that used oil spread data to compare the slick to the size of neighborhoods, towns, and cities. Help Map, an Ushahidi implementation built around Russia's 2010 wildfires. For Gregory Asmolov of Russia's Help Map, which documented relief efforts around the wildfires there last summer, the goal was to facilitate "citizen-to-citizen" relationships, by depicting where there was need for information on the spread of the fires, for clothes, and more. "It was a reaction to Russian society," he says. Russian authorities could, or would, only do so much in the face of a crisis. "There were lots of communities willing to help, but they didn't have a good tool to coordinate those efforts. The Help Map became a kind of alternative government." Each of the mappers conceded, in his own way, that the field of digital mapping is very much a work in progress. "People love maps," said Brian Boyer of the Chicago Tribune, "but people can like maps too much, because they're often the wrong choice." "Maps are excellent at displaying trends," he continues. "But if there's just a smatter of dots, who cares? Just make a list." He points to the Chicago Snow CrowdMap, a project of the Tribune, local TV station WGN and the Chicago Weather Center. "Oh look, there are problems everywhere," he jokes. "People on the north side had problems, people on the south side had problems..." What's more, the map did a poor job with time, and it matters whether power has been out in a neighborhood for four hours or four days. "We have so much geo-spatial data," says Gundersen, "but putting that data on a map in ways that tell a complex story is still really hard. That's the next frontier." Data quality and ownership is one of the most critical questions when it comes to mapping. With the rise of open tools, critics worry that crowdsourced mapping, where anyone can submit data to a map, can be dangerous, or at least too messy. Meier pushes back. "Folks that have been around the [disaster response] field know that information is perishable. If you're living in a village that might be under attack, would you rather be aware of that rumor, or would you rather not know? Some information is better than no information. And Warren, at least, worries about the presumption that new mapping technologies are inextricably tied to the open data movement. "Does it always have to be open source?," he says, before answering his own question. "No, some data doesn't have to be." Communities with unsettled land claims might not be eager, for example, to have their fields and grazing patterns precisely plotted out. "They want to keep it private, and that's legit." He points to mapping work he did in some of Lima's challenged neighborhoods. "We haven't submitted it to OpenStreetMap. We haven't made it compatible with any other system. We haven't translated it into anything beyond being just a picture." The mappers admit that maps are often only a fraction of the solution. Asmolov says that Help Map really took off when he and others set up and staffed an outreach and coordination center in Moscow. A big part of any successful project, says Meier, is training, strategy, and outreach. "If you're missing that ninety percent, you're definitely going to get a ten percent on the exam." And human geography can present its own challenges. "Ask a resident of Delaware how easy it is to come to a map and click on their state," says Boyer. In American elections, its common now to see state-based election maps a far more polarized picture of red-blue America than maps adjusted for population showed. But these cartographers see hope in design, even if at the moment having real aesthetic control over maps is a goal, rather than a reality. Take color choices. The Tribune's mayoral election map had eventual winner Rahm Emanuel in purple, and other candidates in green, orange, and pink. The hope, says Boyer, is to not connote goodness or badness. Where possible, says Boyer with a laugh, "we try to avoid making our own choices," so he recommends tools like the site Color Brewer, which spits out color palettes that work well with shaded maps. Sometimes, the choice is towards simplicity. New map tools make it possible to hid data until you zoom into a level that makes it relevant. "We needed one map to show the entire history of broadband all at once," says Gundersen of the school broadband map. That meant paring down the map to show simple broadband tendrils, school locations, and the barest outlines of states that look almost as if they were sketched in by pencil. At the Chicago Tribune, they're entertaining the counterintuitive idea of making maps that look more like paper ones. "Let's present people with the metaphor they're familiar with," says Boyer. Added bonus: such-designed maps are easier to print. Boyer is also exploring side-by-side maps, rather than piling on data layer after data layer on a single map. Another design option is to make it possible for map consumers to create their own maps. The urban open data movement has revealed so much, says Turner, whose GeoCommons projects has focused on making self-generated maps as easy as creating a chart in Excel or uploading a video to YouTube. But how do you empower people to pin it together in meaningful ways? One possibility is creating tools that allow, say, a person moving into a new city to adjust for their own preferences. Do they have kids? Dogs? Asthma? New York Magazine went this route last April. Numbers whiz Nate Silver was asked to find the best neighborhood in New York City. It turned out to be leafy Park Slope. But the magazine also published a a livability calculator that offered sliders based on your own interests. Dial down the importance of schools, and it turns out that you might prefer the bar-heavy Lower East Side. In the UK, MySociety teamed with the Department for Transport to produce maps showing commute times depending on when Londoners chose to leave for work. A Google "mapping party" in the Philippines; photo credit: Malditang Pinay. While our mappers are all either independent developers or those working in small mapping teams, and with an open-source mindset, the bigger players are starting to sniff around their space. Google once had little interest in mapping, say, Afghanistan. Not a lot of advertising potential there. But the search giant has started throwing "mapping parties" in places like Nairobi and India's Kerala. "You have to remember that in these parts of the world, Google is not necessarily a company," says Coast. "It's a force for change and good. The Google van arrives with free ice cream," and locals are given the chance to finally, and literally, put their town on the map. "Imagine OpenStreetMap, but it's proprietary and Google owns everything," says Coast. Warren bristles at the idea that a deeply-resourced company like Google is better suited to be the long-term keeper of local geographic data than small start-ups like his own. "Well, they just got rid of Google Video," he points out. Where digital mapping goes from here remains to be seen, but it's a safe bet that we'll be seeing more of it. "This mapping thing is about to blow up," predicts Gundersen. "And as people want to start making data-driven decisions, we're going to have to start getting better at making maps."